A year 11 and year 12 student at Centralian Senior Secondary College have worked out how to graduate from high school and at the same time gain qualifications toward their career choice of child care. 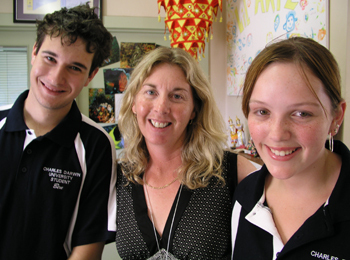 Amanda Swain and Ben Everett are enrolled in a VETiS child care program (VET in Schools) through Charles Darwin University’s Alice Springs campus. Both students have elected to expand their child care studies by undertaking extra child care classes at night and on weekends so they can progress through all 15 units needed to gain a certificate III qualification in Children Service. Children Services lecturer, Heather Wilson explained that Amanda Swain has been working after school in a local child care centre for more than six months. The child care centre, Li’l Antz, offered her an immediate apprenticeship. While Amanda appreciated the offer, she refused so she can finish years 11 and 12. Ben Everett is currently gaining practical experience by working in the industry one day a week for a year. For further information on child care programs in Alice Springs contact Heather Wilson on 8959 5320. Further information on vocational education for secondary students, Lyle Mellors can be contacted on 8959 5291.